NTU welcomed Freeths LLP on campus to mark the official signing of a new strategic partnership. 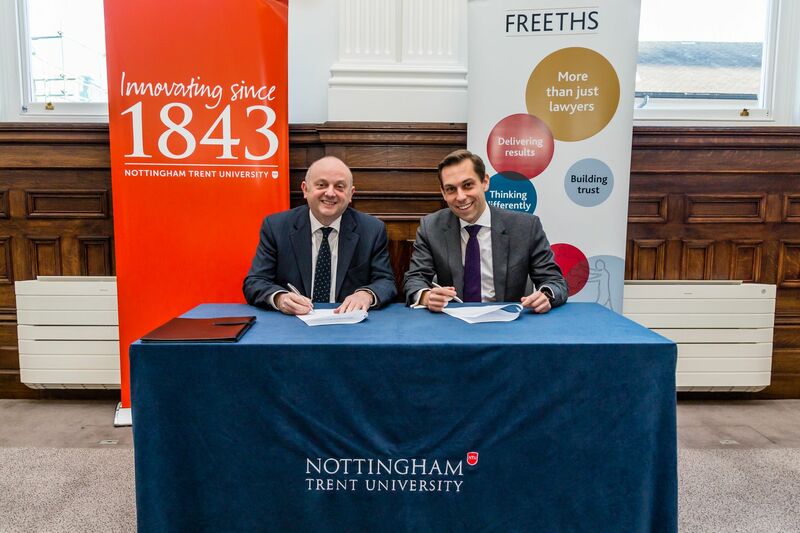 Freeths LLP, a national full service commercial law firm, and Nottingham Trent University have announced a new strategic partnership, focused on providing opportunities to students, and exploring key issues within the legal sector such as digital technology transformation, skills shortages and improving social mobility into the profession. Freeths was founded in Nottingham and now has twelve offices across the UK and over 850 members of staff. The firm continues to experience strong growth and ranks 50 in the Sunday Times Top 100 Best Companies to Work For. Freeths will be able to benefit from the research and development expertise at NTU, including opportunities to further understand the challenges and opportunities posed by 'LawTech' through the pursuit of joint innovative projects and knowledge exchange activities. This partnership will also encourage further collaboration between NTU and Freeths through shaping Nottingham Law School's teaching and learning in preparation for the implementation of the new Solicitors Qualifying Examination. Freeths will continue to provide placements, mentoring and representation on the Nottingham Law School Employers' Board. Chris Freeston, National Head of Commercial and Managing Partner of Freeths Nottingham Office says, "We are excited by the prospect of working with NTU as one of its strategic partners. NTU has an enviable reputation in a number of areas, and as a growing and innovative national law firm with a strong presence in Nottingham, there are numerous areas where we can work collaboratively with the University that will be mutually beneficial to both organisations, their staff and students." Professor Edward Peck, Vice-Chancellor of Nottingham Trent University who attended the signing said "Freeths LLP is an exciting new addition to Nottingham Trent University's strategic partnerships portfolio. This partnership will allow NTU to work closely with a leading national law firm, with a shared commitment to social mobility and provide work experience opportunities to more students from underprivileged backgrounds. Freeths and NTU will also collaborate through sharing intelligence to understand the impact of digital technology transformation on the law sector, and helping to refine our teaching to produce the best 'lawyers of the future' to meet changing industry needs."